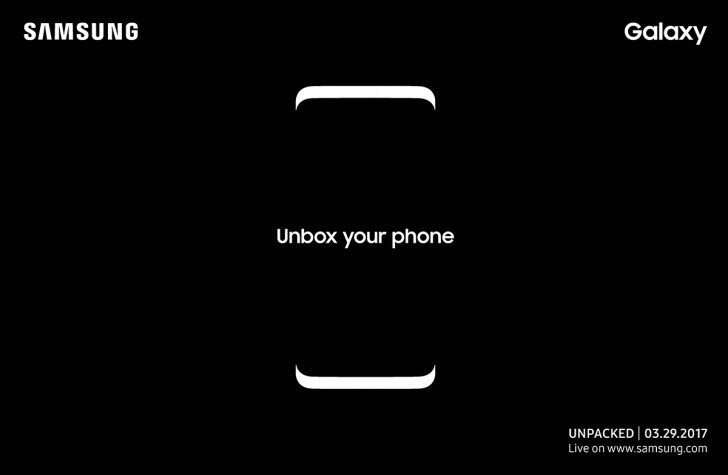 In an official blog post today, Samsung has finally confirmed the next galaxy unpacked event scheduled for 29th March in new York where the company will launch its new flagship devices Galaxy S8 and Galaxy S8 Plus. The teaser posted by the company confirms the dual-curved bezel-less display with no physical home button on the front as we saw in the previous rumors. The event will start at 11:00 a.m. EDT (9:30 PM IST) in New York on March 29, 2017 and will be streamed live on Samsung official website and on official YouTube channel. The company also posted a video teaser on their YouTube channel showing a glimpse of the phone. The Galaxy S8 is rumored to launch with a 5.8-inch Quad HD+ curved Super AMOLED display with pressure sensitive technology and 2560×1440 pixels resolution. it will be powered by the Qualcomm Snapdragon 835 or an octa-core Samsung Exynos 9 Series 8895 processor. It will have 4GB of RAM with 64GB internal storage capacity with MicroSD card expandable storage. It will run on the Android 7.0 (Nougat) OS and will have Dual-SIM capabilities. A 12-megapixel Dual Pixel rear camera is expected to be available with LED flash and f/1.7 aperture along with an 8-megapixel front-facing camera with f/1.7 aperture. It will be backed up by a 3000mAh battery with fast Charging via wired and wireless (WPC and PMA) charging options and we will have 4G VoLTE, Wi-Fi 802.11ac, Bluetooth 4.2 LE, GPS with GLONASS, USB 2.0 and NFC connectivity options. A 3.5mm headphone jack is expected and there will be a heart rate sensor, fingerprint sensor available on the rear side with Iris scanner and Barometer. The Galaxy S8 will be IP68 verified with water and dust resistance feature. The bigger Galaxy S8 Plus will have a large 6.2-inch Quad HD+ curved Super AMOLED pressure sensitive display with 2560×1440 pixels resolution and will be powered by a Qualcomm Snapdragon 835 or Octa-Core Samsung Exynos 9 Series 8895 processor. There will be 4GB of RAM along with 64GB internal storage and MicroSD expandable storage capacity. It runs on the Android 7.0 (Nougat) OS out of the box with Dual-SIM support. it will again feature a 12-megapixel Dual Pixel rear camera is expected to be available with LED flash and f/1.7 aperture along with an 8-megapixel front-facing camera with f/1.7 aperture. A 3500mAh battery with fast Charging will power the device via wired and wireless (WPC and PMA) charging options. Connectivity options expected are 4G VoLTE, Wi-Fi 802.11ac, Bluetooth 4.2 LE, GPS with GLONASS, USB 2.0 and NFC with a 3.5mm headphone jack. It will also have heart rate sensor, fingerprint sensor, Iris scanner and Barometer. The Galaxy S8 will be IP68 verified with water and dust resistance feature.